Sigenics' engineering and manufacturing services allow our customers to enter the market rapidly, using electronics constructed with standard, readily available off-the-shelf components. Our expertise in ASIC design and manufacturing gives us the ability to continue with our customers toward higher volumes and lower costs, by integrating significant portions of the electronic assembly into a custom monolithic ASIC device. The ASIC integration transition is managed as a part of the overall supply chain during the product life cycle; some products will transition rapidly to compact high-volume ASIC form, while others may never need to transition to an ASIC. 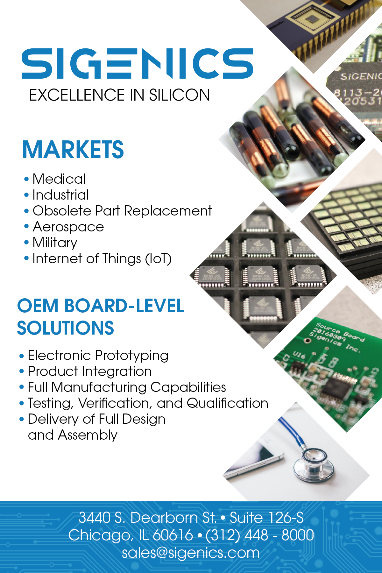 Sigenics' engineering and manufacturing services include design and manufacturing of conventional printed circuit boards, as well as technologies used for more compact assemblies, such as flex, hybrid, chip-on-board, and chip-on-flex. The Sigenics engineering team includes expertise in sensor and transducer interface circuitry, embedded microcontroller systems and firmware, and non-contact technologies such as RFID, wireless power transfer, Bluetooth links, and capacitive sensing. 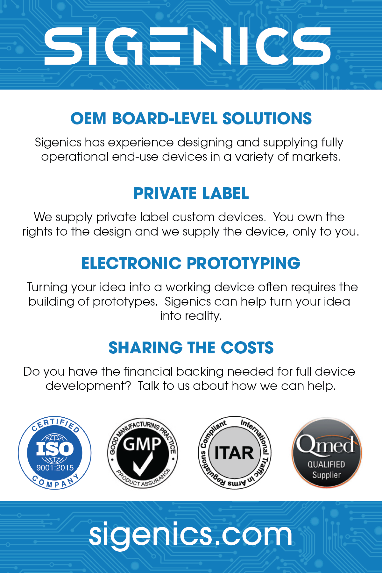 If you need electronics in your product, Sigenics can help you, all the way from concept to production. Our engineering design team will work with you to develop the electronics design based on your needs, and our manufacturing team will deliver tested electronic components to be included in your product. If needed, Sigenics can contract with full mechanical assembly vendors to deliver finished, fully assembled product to you or your distributor.